We’d love your help. Let us know what’s wrong with this preview of The Green Lantern Archives, Vol. 1 by John Broome. 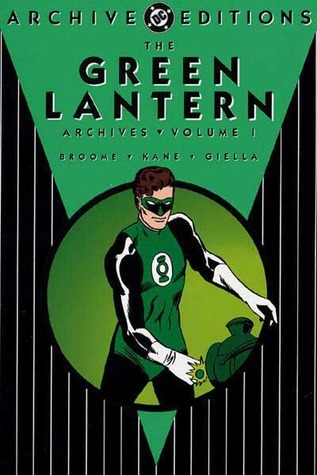 To ask other readers questions about The Green Lantern Archives, Vol. 1, please sign up. Fun collection with some very nice artwork. Good writing with very simple storylines that move along at a fast pace. I loved the sci-fi aspects of the stories and for the character of Green Lantern. The Green Lantern symbol/emblem is iconic and I liked the Inuit character, Thomas Kalmaku. He was a good sidekick that provided some laughs. My favorite issues were the invisible destroyer storyline from Showcase #23 and Green Lantern #5. A very good collection of the silver age and most recognizable Fun collection with some very nice artwork. This volume collects GL's Showcase try-out issues, as well as the first few issues of his own mag. Broome's stories are great, and the art by Kane and Giella are top-notch. Like most of DC's silver age, the stories are primarily sci-fi influenced, and the love "triangle" between Hal Jordan/Carol Ferris/Green Lantern is pretty swift. It's nice to see ol' Pieface here, Thomas Kalmaku. In an age where rampant racial stereotypes abounded, Pieface is played straight. No accent, nothing that makes him This volume collects GL's Showcase try-out issues, as well as the first few issues of his own mag. Broome's stories are great, and the art by Kane and Giella are top-notch. It's nice to see ol' Pieface here, Thomas Kalmaku. In an age where rampant racial stereotypes abounded, Pieface is played straight. No accent, nothing that makes him seem anything other than Hal Jordan/Green Lantern's best friend. No explanation is given for the name Pieface, so maybe I'm missing something there. GREEN LANTERN beat them to it. Stan Lee & Jack Kirby are wrongly credited with being the first to build complex worlds for comic book characters, soap operaish emotional lives, introducing families and continuing stories. Julius Schwartz, John Broome, and Gil Kane were there first as proven by this entirely satisfying reprint of the first eight issues to feature this incarnation of the character in stories published between 1959 and 1961. These stories are more satisfying than Kirby and Lee’ GREEN LANTERN beat them to it. Stan Lee & Jack Kirby are wrongly credited with being the first to build complex worlds for comic book characters, soap operaish emotional lives, introducing families and continuing stories. Julius Schwartz, John Broome, and Gil Kane were there first as proven by this entirely satisfying reprint of the first eight issues to feature this incarnation of the character in stories published between 1959 and 1961. These stories are more satisfying than Kirby and Lee’s for three reasons. First, Lee and Kirby usually floundered in their first several issues as they tried to find the character and the sorts of stories that would work for him. GREEN LANTERN improves with time, but finds its basic footing in the first story. Second, Lee and Kirby tended to repeat the same story. A villain gets a super-power, does something bad, and there are many pages of fighting with the hero. GREEN LANTERN plots are more complex. While there are certainly battles, the fights are just one approach to besting the villain. Other problem solving skills are involved. Finally, Lee tended to trowel on the soap opera like make-up on a model. You can’t see the model’s real face and you can’t see Jack Kirby’s art behind all the world balloons. The emotional issues in GREEN LANTERN are just as juvenile, but they do not slow the narrative to a molasses pace, which is the problem with Lee’s work. After several years, the Lee/Kirby comics did grow richer than DC's, but at this point DC had the edge and by a lot. Stories are simple but fun, Green Lantern's oath gets ridiculous (I wonder how he feels having to say it *every day*), and the "romance triangle" is exasperating. Also having all the titles end in an exclamation point makes me think of "The Plastic Bag That Flapped!" but that seems to be the convention of the time.